Mr. Wolfgang Kiessling, president and founder of Loro Parque and Loro Parque Fundación, received the Global Humanitarian Award from American Humane, the United State’s first national humane organization, in recognition of his lifetime efforts to protect Nature and preserve its biodiversity. 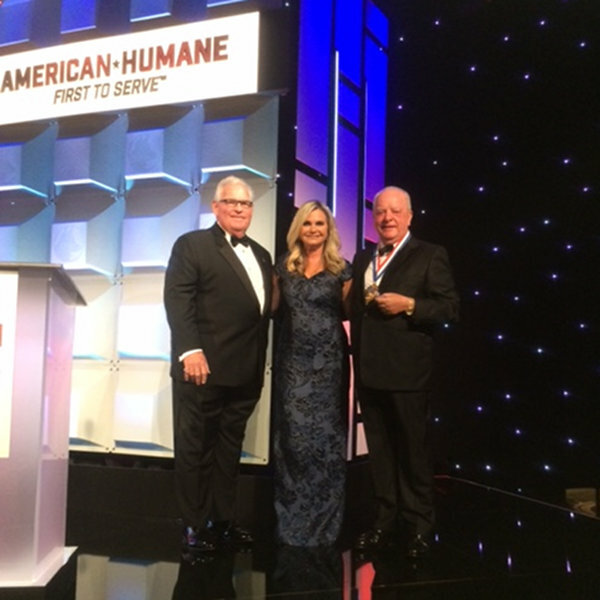 The award was given during the nationally televised 2017 American Humane Hero Dog Awards at the Beverly Hilton Hotel in Los Angeles, California (United States). Mr. Kiessling is the first person to receive this recognition, which came after Loro Parque became the first European zoo to be Humane Certified™ by American Humane in May this year. The 13.5-hectare zoo passed a rigorous third-party audit that confirms Loro Parque is in compliance with American Humane Conservation standards, ensuring that the animals in the park enjoy the best conditions in areas such as health, housing, social interactions, adequate environments and proper preparation and protocols to manage medical or operational emergencies. In this sense, Loro Parque has also been recently acknowledged as the “Best Zoo in the World” by TripAdvisor, an award given based upon thousands of independent reviews from the visitors that want to share their experiences in Loro Parque with other users of this worldwide platform. Furthermore, Loro Parque confirmed its full compliance with the Global Welfare Standards of the Association of British Travel Agents (ABTA) after being inspected by the auditors of Global Spirit and obtaining the highest possible rating of 100%. Among the members of ABTA are leaders in the tourism industry, such as Thomas Cook and TUI UK. The protection, conservation and educational efforts of Loro Parque cannot be fully grasped without knowing about its research and conservation programs, which have been carried out since 1994 through the Loro Parque Fundación. Thanks to the support of Loro Parque, its partners, visitors, friends and collaborators, more than 17 million dollars have been directly invested for the development of conservation programs both in situ and ex situ.